The place is so visually stunning and boasts such a rich history it even saw Quentin Tarantino there for the filming of “The Hateful Eight” and staged Butch Cassidy’s first bank robbery. However, the star of this show is Telluride’s mountains. After all, why would you be reading this on mountainwatch.com if not for their lure? To continue with the snow globe analogies, Telluride isn’t walled in by a glass dome, rather, it is walled in by towering mountains on three sides. 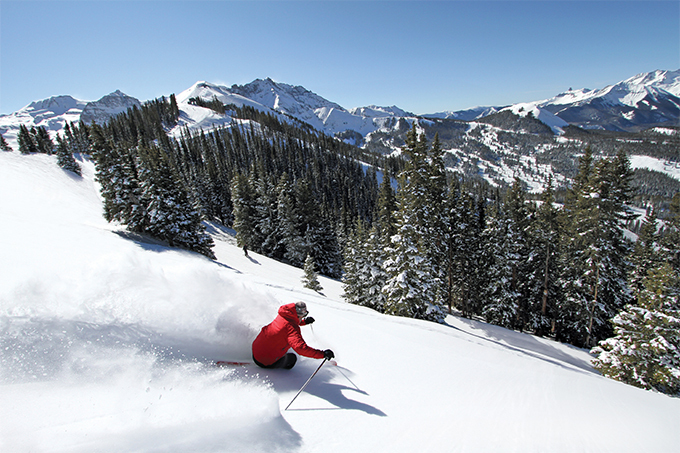 Telluride Ski Resort is tucked neatly into Southern Colorado’s San Juan Mountains, an area known to hold the highest concentration of 13,000 and 14,000 foot peaks in North America. 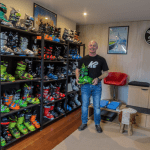 For us Australian’s, this means the resort can boast a modest base elevation of 2,659m and more importantly, a top elevation of some 4,060m (known as Palmyra Peak – an extreme in-bounds hike to zone). 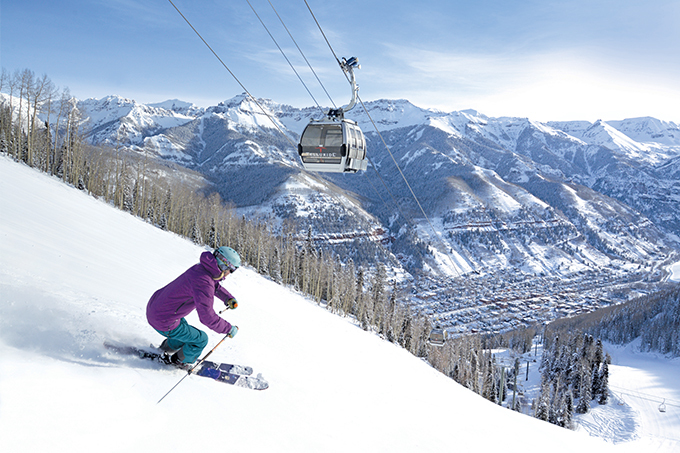 With a vertical drop of 1,349m, it’s unsurprising really that Telluride offers the smorgasbord of terrain that it does. Many readers will be pleased to hear that 41% of the terrain is touted for the advanced/expert, with the likes of in-bounds double blacks, chutes and plenty of cliffs from which to huck your proverbial meat. The drop into Palmyra peak, even boasts a slope angle of 46 degrees, that later ‘eases’ to an impressive 37 degrees. However, many more readers will be pleased to hear about Telluride’s terrain ideal for the advanced intermediate. For those that look to lap the chair at high speed, day in and day out, Telluride boasts a self contained canyon full of double blue trails. Intermediate terrain covers 36% of the resort, including some pretty enviable glade skiing, while beginners can own the remaining 23% of the resort’s trails. Beginners will also be pleased to know groomed trails stem from every chair, so the often ego-destroying chairlift down-load is a rarity. This also means that beginner and intermediate skiers can access not only the highest peaks, but the views that are afforded by them – views typically reserved for the experts. Just as the mountains exude a European Alps like vibe, so to do Telluride’s restaurants. The smorgasbord of terrain is matched by the smorgasbord of food options. Within Telluride town itself, you can enjoy a pizza at the ‘Brown Dog’, a barbecue at ‘Oak BBQ’, tacos at ‘Taco del Gnar’ or a burger at ‘Steamies’. As to getting between these fine establishments, you can wave goodbye to the rental car… the town is only eight by four blocks wide. Should you wish to escape the cowboy charm of the lower Telluride village, a village that became a national historic landmark in 1961, then a free 13 minute gondola ride will whisk you up to the so called ‘mountain village’ that’s more akin to Whistler or Beaver Creek. Here you’ll find a variety of luxe modern accommodations, from 5-star luxury hotels to ski-in/ski-out self-catered apartments, set amongst boutique shops and gourmet restaurants. Notable mentions would have to go to The Madeline Hotel, The Peaks and the aptly named Mountain Lodge, where slopeside convenience and hot-tubs meet. 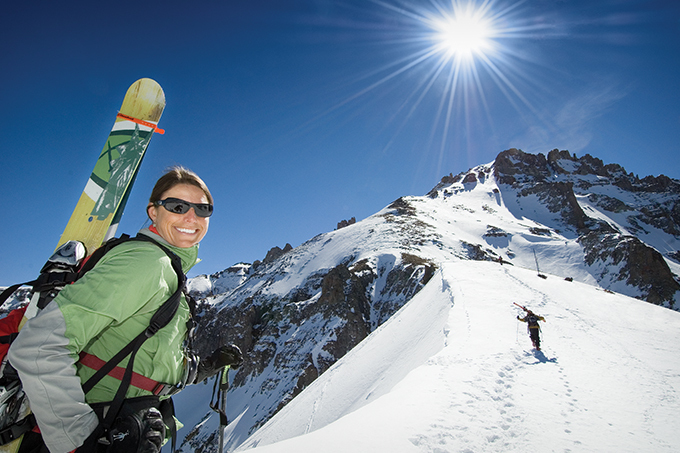 Travel even further up the mountain and you’ll see why Telluride is touted as being one of the best gourmet snow resorts in the entire United States. 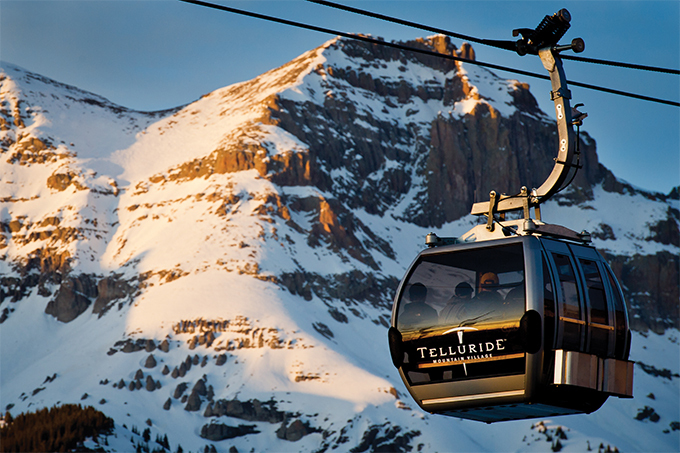 At 12,000 ft (3,657m), Telluride can also lay claim to North America’s highest restaurant in the, Alpino Vino. It’s a quaint European hütte, where you can enjoy either a midday/mid-ski antipasti or if you can wait until dinner, a five course Italian meal. Other eateries I’d be remiss for not mentioning include Telluride’s flagship restaurant, Allred’s, which is found – like all truly great restaurants – at the top of a gondola, as well as Bon Vivant, which combines classical French country cuisine with classical Coloradan mountain views. 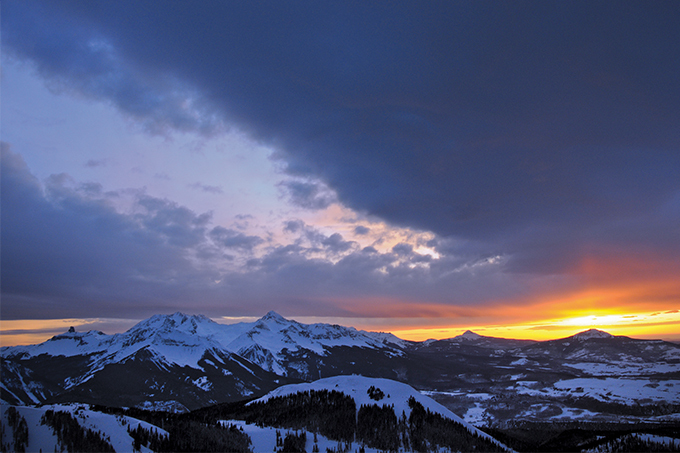 All these elements have combined to see Telluride Ski Resort be awarded no. 1 ski resort by readers of Condé Nast Traveler, for 4 out of the last 5 years. It’s also been dubbed North America’s best resort for Overall Satisfaction by Ski Magazine as well as raking in 1st place finishes regarding both Scenery and Character. Naturally the final question then is, how do I get there? Well it’s no longer the wild west/final frontier that it once was and getting to Telluride is far easier than you may think. There are over a dozen nonstop flights available from all major US hubs to the Montrose airport, which is only 105km away from the slopes, or a 90-minute transfer. Should you need anymore convincing, you’ll be interested to know that Telluride is also now a member of the Mountain Collective tribe. 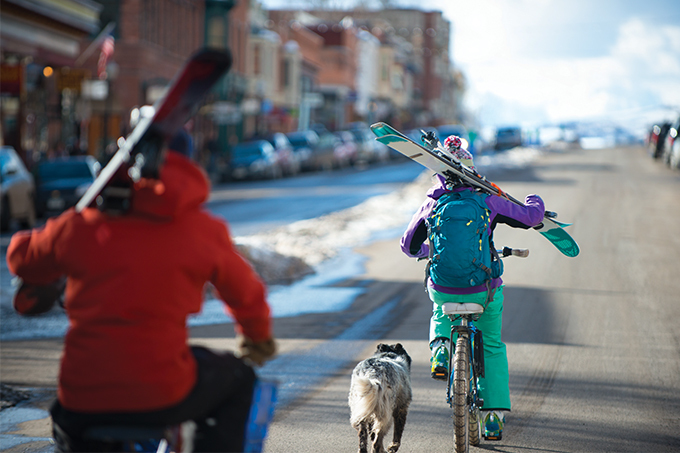 With an average annual snowfall of 789 cm (300+ inches) and around 300 days of sunshine per year, after you visit you’ll surely be telling others to ride Telluride. 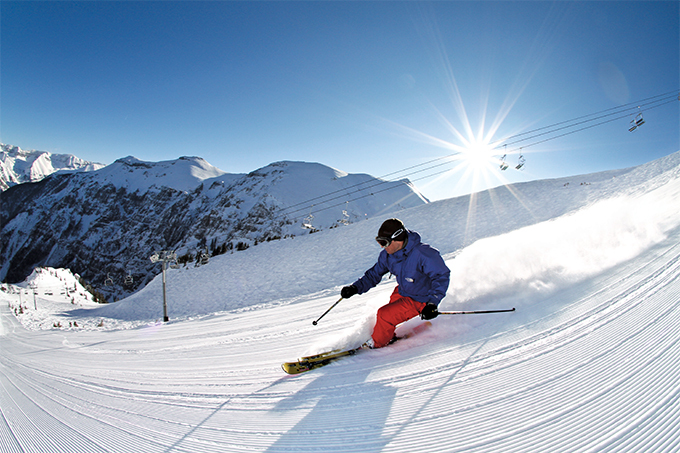 Head over to Ski Max Holidays website and see what deals are on offer.